Taking a fresh approach to selling the three-door variant of the ever popular Astra hatchback, Vauxhall - or more accurately parent company Opel - decided to make it significantly different to the five-door model. It's a clever strategy, and one that may make the Sport Hatch more appealing than conventional three-door versions of the Ford Focus and Toyota Corolla. As the slightly contrived name suggests, the Sport Hatch is supposed to be more aggressive and 'edgy' than the practical five-door Astra. At a glance, few changes are immediately apparent, but allow the eye to linger and some subtle but effective changes soon reveal themselves. Roofline and suspension are both lower, and reshaped body panels give the Astra Sport Hatch a wide, purposeful and muscular stance. Saying a hatchback is 'coupe-like' is a favourite trick of car manufacturers but for once it is justified. The regular Astra is good looking. The Sport Hatch is great looking. The changes aren't just cosmetic, either. The Sport Hatch drives with a keener edge. Sharper steering, a boomier exhaust note and high levels of grip mean that it is possible to drive this car very enthusiastically. Keen drivers will be impressed, though to get the very best from the chassis, some fairly expensive extras such as the IDS-plus package need to be selected from the options list. And speaking of options, the most unusual is an intriguing swooping glass roof. 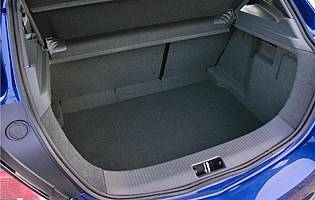 A certain amount of space is sacrificed on the altar of sportiness - mainly in the rear seats and boot - but the Sport Hatch remains a practical vehicle. It's possible to give a couple of adult friends a lift across town, though longer journeys would soon have cramp developing. Perhaps the greatest recommendation for the Astra Sport Hatch is that it feels very similar to the BMW 1 Series, both inside the cabin and in its on-road behaviour. It may lack the much-vaunted 50/50 weight distribution of the BMW but it drives as sweetly, seems just as well built and of course is much cheaper. With the Sport Hatch, buyers can at last choose a three-door variant without feeling they are missing out on something. Indeed they will feel they are getting a far more exciting machine, even if it does mean they no longer enjoy a financial saving. The added value that has been put into the Sport Hatch is the justification for ratcheting up prices so that there is now no difference to the equivalent five-door Astra. The extra outlay is probably worth it, as the Sport Hatch is expected to retain its value more effectively than the regular hatchback. 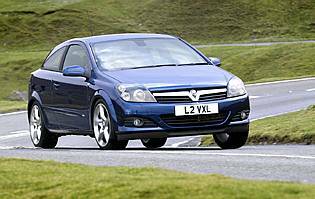 Running costs should be reasonable and at least buyers will know that Vauxhall's extensive network of workshops will never be far away should remedial work be required. The boot is significantly smaller than the five door model's (302 litres versus 350 litres), though that's still plenty for a few boxes of fruit and veg. On second thoughts, Astra buyers are more likely to purchase microwaveable ready meals, so there's room for dozens. There are few other storage options, with most of the cabin nooks and crannies being very limited in size. Formerly a purveyor of some eminently forgettable dashboard designs, Vauxhall has made some significant advances in recent years. Dials and controls are nicely finished and arranged without ever really convincing that they are premium quality. The annoying indicator stalks from the Vectra remain. Front seat passengers are well catered for, rear seat passengers less so. The roofline stays high for as long as possible then falls abruptly near the rear screen, so anyone around the six-foot mark may have to tilt their head forward slightly. Their knees are also likely to be somewhere near their chin as rear legroom is limited. Then again, if frequent passenger carrying is a concern you're probably better off with the five-door Astra. All versions of the Sport Hatch come with remote control central locking as standard along with Auto Lock, which will automatically secure the car five minutes after it was last unlocked if no doors have been opened in the meantime. So whatever you do, don't leave your key inside. Spending some extra cash on a decent alarm system is highly recommended, as this is a car that will appeal to joyriders and thieves. Body rigidity is impressive and is unaffected even with the panoramic windscreen in place. Front, side and curtain airbags feature on all models but disappointingly active head restraints which can dramatically reduce whiplash injuries are not standard issue. Vauxhall's Pedal Release System (PRS) releases the brake and clutch pedals during an impact to reduce the risk of a driver's feet being trapped in an accident. An electronic Stability Programme (ESP)-plus comes as standard on the Sport Hatch SRi and is an option on the Design and SXi. Astras of all generations have always been fun to drive, and this might just be the best ever. The automatic gearbox is fine, but this is one car that demands to be manually-shifted for maximum enjoyment. Steering is so sharp it takes a while to get used to. The wide stance and fat wheels allow corners to be taken confidently at speed. Even if you disengage the electronic safety aids and start sliding the car around, it remains predictable and responsive - the sure sign of a well-balanced machine. The reduced rear space and lack of storage areas throughout the cabin makes the Astra Sport Hatch unsuitable for general family use. As a fun weekend alternative to a Meriva or Zafira it could serve a purpose. Make no mistake, the boy racers a decade or so hence will have the Astra Sport Hatch firmly atop their wish lists. Vauxhall isn't a particularly prestigious badge but it's a cult favourite among 'modders'. Until then, first time buyers will probably have to wait, unless they get the option of a Sport Hatch via a company car scheme. Vauxhall will argue, but the fact is that boy racers aside, the public doesn't have any particular love for the Vauxhall badge. We know they are rebadged Opels (and Holdens) so why GM sticks with the naff Griffin badge is a mystery. If further proof is needed, on the continent they call this car the Opel Astra GTC, which sounds far sexier than Vauxhall Astra Sport Hatch, even if it is built in Belgium. Anyone with a disability or restricted mobility is likely to find the Astra Sport Hatch problematic. Seats are lower than in the five-door Astra. While this is undoubtedly sporty, it's awkward. Rear doors are small and heavy, and loading items through the narrow aperture requires them to be raised to a considerable height. 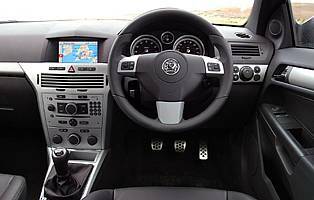 Vauxhall's audio systems don't generally get music lovers enthusing the way some other marques do, but for the vast majority of users they are perfectly adequate. A CD/radio with steering wheel mounted audio controls is standard issue and all versions of the Sport Hatch are available with an MP3 compatible CD-playing audio package for a very small extra outlay. Being able to read the special compressed files means that almost 10 hours of music can be crammed onto a single disc - far more than in a conventional CD-multichanger. DAB Digital Radio is another tempting extra. Bright, almost gaudy colours are required to best show off the Sport Hatch's extra creases and vents. Traditional Vauxhall racing colours such as scarlet and even white do the business. All trim levels look attractive, though the chrome strip running horizontally through the cabin still seems rather contrived. Excellent sports seats are provided in all cars. Retaining the Astra's compact dimensions, slotting the Sport Hatch into a parking bay isn't too tricky, despite the low seating position, limited rearwards visibility and an unimpressive turning circle. Judicious use of the mirrors should negate the need for rear parking sensors. Space saver steel spare wheel comes as standard. Four petrol and three diesel engines. Petrols are a 1.4 (88bhp), 1.6 (104bhp), 1.8 (123bhp) and 2.0 turbo (168bhp). CTDi diesels are a choice of 1.7 litres (99bhp), and two 1.9-litre units of 118bhp or 148bhp. Transmissions include both five and six-speed manual gearboxes plus a conventional automatic and an Easytronic clutchless system. 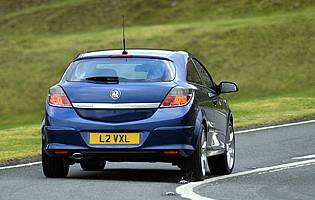 The Sport Hatch only has the sportier designations from the Astra range available: SXi, SRi, Design and ultimately a hotter VXR version (237bhp).